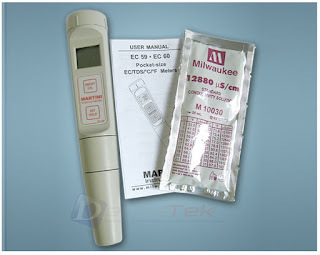 Segera hubungi : +6281283804273, wa : +6281932632003 dengan Subarkah (Darmatek) untuk penawaran harga Milwaukee EC60 Conductivity/TDS/Temperature Meter di Jakarta. Milwaukee EC60 shows on the dual-level LCD the EC (20.00 mS/cm) or TDS (10.00 ppt) value. It also displays the temperature from 0.0 to 60.0°C (or 32.0 to 140.0°F) on the secondary level at the same time.